President Bush is now daring Congress to defy his demand for more unchecked power to spy on Americans without warrants, vowing to veto temporary surveillance legislation and politicize his last State of the Union address for an attack on Democrats. Last week, Democratic leaders were considering a bill to grant a one-month extension of the administration’s spying powers, a "compromise" tilted in Bush’s favor, but Republican tactics have finally tried the patience of Majority Leader Harry Reid. He had been managing floor votes to advance the Republican bill and squash opposition from the majority of Democrats within his caucus, but that may change this week. "The White House threat to veto a short extension of the Protect America Act is shamefully irresponsible," says Reid, who also derided Bush’s new threat as simply "posturing" for the State of the Union. Reid added that if any terror-related problems were caused by legislative delays, "the blame will clearly and unequivocally fall where it belongs: on President Bush and his allies in Congress." That’s tough talk. It has not been matched by action yet, and unfortunately it does not add up anyway. While most Congressional Democrats have begun confronting Bush’s unconstitutional demands, a few leaders like Reid and Intelligence Chair Jay Rockefeller are actually the ones pushing the Bush spying bill. That’s the problem with Reid’s new complaint. At this point, Bush’s "allies in Congress" on surveillance include Reid and Rockefeller. It may be hard to tell — since Bush is repaying them with "shameful" attacks, as Reid said — but they sidelined the more responsible spying bill to help Bush last week. (The "Leahy alternative" was backed by most Senate Democrats, and is closer to a Democratic bill that already passed the House.) Even with Reid pulling strings for Bush, Senate Democrats only fell four votes short of keeping the better bill alive. And they were missing two votes from their colleagues on the campaign trail, Barack Obama and Hillary Clinton. Yet even Obama and Clinton are back in town for a night of pomp and rhetoric at the State of the Union. They both talk about "change" and "results" — and here’s a chance to act on it. It will take more than a speech or a vote to stop Bush’s bill, though, it will take leadership. That means confronting the people who are wrong in both parties — an (unpopular) President and the floor manager of an (unpopular) Congress — to stop amnesty and the blueprint for a surveillance state. It’s also what many Democratic voters want to see. 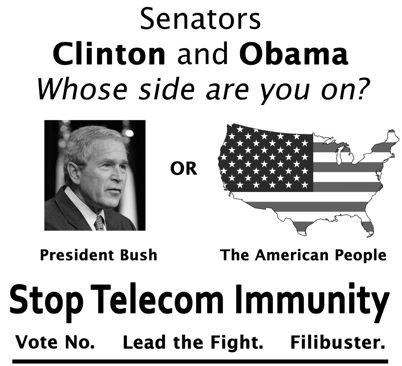 The grassroots group Democracy for America (DFA) is running a full page ad in this week’s Times pressing Obama and Clinton, while the netroots is pleading with Senators to defend the "rule of law." 1. Use their influence and political capital to recruit two more votes for the Leahy bill. That’s all Leahy, Feingold and Dodd need to keep their fight alive under the current rules. Obama and Clinton were endorsed by a total of seven senators who voted the wrong way last week. As DFA explains, "if these presidential hopefuls bring along the support of these senators, they can sustain a planned filibuster [and] defeat any cloture vote." 2. Use their influence and political capital to press Reid to run the floor for the Leahy bill, instead of the Bush-Rockefeller bill. This is is tough for several reasons, but there’s an opening now that Bush has essentially slapped Reid around and drawn some rhetorical pushback. Or they could channel Harry Reid, complaining about Bush while essentially allowing him to win again. Will it be door number 1,2,3 or 4? The truth is that it’s mostly a symbolic thing for the Monday leading up the SOTU, and that’s not a bad thing. It’s a hell of a lot better that they’re taking a public stand on this than if they weren’t… on balance, this is better than I expected and maybe they can at least get the news media to pay attention to this issue with a couple of rousing speeches in defense of the rule of law. The gasbags can waste days talking about ephemeral, campaign trail dust-ups so maybe they can find a couple of minutes to talk about the [C]onstitution. Reader "B_Kool_66" urges people to support DFA’s effort here, and to rally for TV coverage to highlight the issue by contacting MSNBC’s "Countdown" show at countdown@msnbc.com. Olberman has definitely championed constitutional battles before. "METTEYYA," an informed and passionate advocate for Obama here at The Nation site, adds that Obama opposes amnesty for companies that allegedly broke the law by assisting illegal surveillance. That is true for both Clinton and Obama; and they were among the 28 Democratic senators who flatly voted down the spying bill in August. They both have strong voting records and platforms on constitutional rights, and I’ve credited Clinton in this space for her forceful discussion of habeas corpus. But again, I think the issue this week is principled leadership, not simply saying the right things. Bush says he’ll go to the mat to bully Reid into granting him more unchecked power. He even looks ready to tarnish his final State of the Union to do it. And we need leaders who will not only vote against unaccountable spying, but go to the mat with the full power of their office and their bully pulpit to defend the Constitution.